← Shooting well at age 11. May I play with your camera? I would like to upgrade my Panasonic LX-3 to something with a slightly larger sensor. 4/3 is the most likely contender, with Olympus and Panasonic models being most interesting. If you live in Nashville, own such a camera and wouldn’t mind letting my play with it for a couple of days, please let me know. My other option would be to get the smallest Canon DSLR and use a small lens like 35/2 or 50/2.5 macro, but that would still be too large for the intended use. Local stores don’t carry much of a variety and playing with controls at the counter doesn’t really tell me much anyway. Articulated LCD and physical controls instead of a touchscreen are preferred. Panasonic G2 looks like a likely contender, perhaps with a 45/1.8 lens. Anyone with direct experience with that or similar cameras? This entry was posted in advice requested, camera and lens and tagged 4/3, camera, compact. Bookmark the permalink. 13 Responses to May I play with your camera? Олег, с 4/3 непонятная история выходит. Линейка оптики давно не обновляется (хотя с другой стороны – диапазон от 8 до 300 миллиметров закрыт полностью), новые зеркалки не выходят, и вообще всё похоже на то, что альянс забил на нормальный 4/3 и переключился на микро 4/3. П.С. Живу не в Нэшвилле, но если ты не найдешь никого поближе – могу сделать всякие тестовые снимки на DMC-L10 и прислать равы. Micro 4/3 is my main interest. Image quality is less of an issue than the convenience of controls and quality of the viewfinder. Usually, just 4/3 refers to a DSLR format, not micro. So I thought that you talking about DSLR. I bought an Olympus EPL-2 this spring, or some such time. For me the issue was nearly entirely image quality — I was having far too many frustratingly noisy (and just ugly) files from low-light situations with the LX3. EPL-2 is not a step up in controls particularly, and does not have a tilting LCD. Really nice images with the Panasonic 20/1.7 pancake, and only a hair thicker than the LX3, though. So it doesn’t sound like this body is anything like what you want, but there are lots of M43 bodies. What is it with cameras targeted at “enthusiasts” always being missing tilt/swivel LCDs? It used to be the serious system cameras that had interchangeable viewfinders and right-angle viewing attachments. The 45/1.8 gets pretty darned good reviews, but would be rather long for an only lens for me. But I use a 50/1.8 on an adapter, it’s certainly a useful focal length for portraits. I liked your EPL-2 though the mysteriously sound-less video really turned me off the interface. And 20mm is a very useful lens, just too short for my daily use. With 5D2, I use 85-90-100mm lenses for 80% of my photos. Soundless video is not the default state, I did eventually find it and turn it back on. And, not related to that experience, but I ordered a Zoom H2n digital sound recorder yesterday. I have an H2. Let me know if you figure out how to get voice recorded with it without turning up the gain. Ditto on the way-back for the X-15. 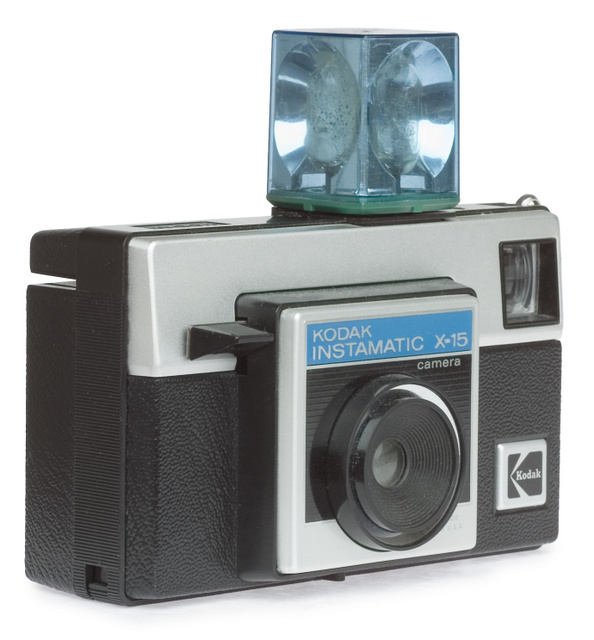 I started with the Boy Scout version of the Brownie Box camera, it shot 120 film and it’s flash took #4 or #25 bulbs, but the first Police Patrol camera I used was the X-15. They had just gotten them for the force when I swore in in 1973, and they replaced the Speed Graflex bellows-type large-format cameras the cops used to carry before that. Of course, the Speed Graflex, used properly, took far superior evidence photos to the X-15, but the brass hats thought that since the use of the big cameras intimidated most of the newbies like me, they provided X-15s so all patrol cops would take and submit evidence photos for all their reports. That idea sort of worked, too, and the amount of photos available jumped dramatically. I bought a G2 around the beginning of the year, along with a 45-200mm zoom lens. It makes a fine daylight trail camera; not so good for low light (though that would of course change with the f/1.8 lens you’re thinking of). The user interface is nice, with actual physical controls for the important stuff (and the face detector prevents inadvertent nasal touchscreenery when using the viewfinder). There’s a risk of inadvertently changing more than one control at a time, for those of us with fat fingers, what with the controls being packed so tightly; I’ve occasionally changed the drive setting while turning the mode knob. Time from flicking the power switch to being ready to take a picture is about half a second. Auto-focus is decently fast, too, and manual fine-tuning is convenient. Despite what the manual says, it works fine with a close-up “filter” in front of either the kit lens or the long zoom lens. The articulated display is a great feature for those awkward shots. I’m a long way from your neighborhood; otherwise, I’d be delighted to see what you could do with it. I’ll probably be carrying it on morning walkies this coming week, in place of the pocket camera, just in case I get a look at the local mountain lion. Did I mention I got a long lens? It isn’t a 4/3, but I have the Canon G12 if that is one that is on your list to consider at all that I am sure I could let you try out for a bit. If you don’t find anyone local with a 4/3 body, I know that Lensrentals out of Memphis does rent a couple of 4/3 bodies and a variety of glass. I haven’t shot professionally for nearly 20 years (good old film, Nikon Fs, Leica RFs, etc.) but I continue to have a healthy interest in photography in a much simplified vein. I adopted the 4/3 format with an Olympus E-P1 and a Panasonic Lumix G1 when both cameras were introduced along with the 4/3 format. My willingness to take up the 4/3 format was due to the fact that I found myself using my Canon G10 more than my Canon DSLR. I’ve been very happy with both the Oly and the Panasonic cameras. I use the Olympus like I did with my Leica rangefinders–mainly with the 4/3 format equivalents of 35mm format 50mm and 35mm lenses and using accessory fixed optical finders. The Panasonic’s electronic viewfinder is handy for focusing Leica screw-mount and M-mount lenses when attached with adapters. The 4/3 format is extremely friendly to other brands of lenses with an extensive range of various lens adapters available. If there’s a downside to the 4/3 cameras, in my opinion, it’s the physical size of both brands camera bodies. They pack a lot of control buttons and wheels on these cameras and I have large hands. They’re pretty difficult for me to handle effectively at times. But considering the continued introduction of new 4/3 lenses, upgraded bodies, optics versatility and the image quality, I’m more than happy with the format. I keep hoping for a model with a built-in focusing optical finder capable of handling various formats (think Leica with frame lines). That would be as good as it gets in this format.